Pre-moistened towelette instantly reduces stains. Cuts grape juice, coffee, blood and baby formula. Pre-treat stains on clothing--even during wear. 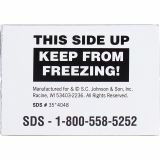 Safe on colorfast washable and dry-cleanable fabrics. 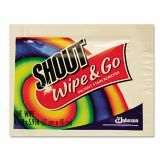 Shout Wipe & Go Instant Stain Remover, 4.7 x 5.9, 80 Packets/Carton - Wipes provide convenient, portable, instant stain treatment and removal. 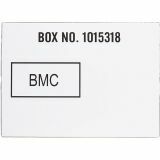 They are ideal for clothing, carpet and auto interiors. 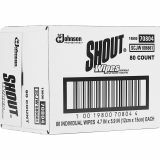 Special stain-fighting ingredients instantly reduce the visibility of the stain. 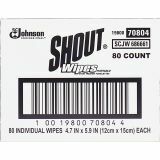 Each wipe keeps most stains from setting into clothes, eliminating many stains completely. 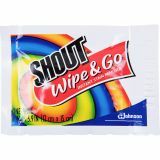 Wipes are effective on grape juice, coffee, blood and other stains. Formula is safe on all colorfast washable and dry-cleanable fabrics. 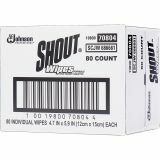 Instant stain remover wipes are individually wrapped.